Welcome to my website I have been a self employed craftsman toolmaker since 1983, as you can see I am equally into meticulous design as well as the highest workshop standards. My interests are many, garden sundials including equation of time, model marine steam engines, paddle wheels, hand tools for craftsmen, handmade fly fishing reels, woodworkers honing guides for fast accurate sharpening and woodworkers marking and measuring hand tools. 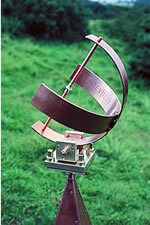 A Richard Kell garden sundial with adjustable latitude mounting was chosen by Crathes Estate (Banchory, Aberdeenshire) in 2005, a tremendous honour as Crathes Gardens has the Sir John Mylne sundial of 1630. I put 100% effort into all my work, every component is made to interchangeable limits in my own workshop (Bridgeport milling machine, Ward capstan lathe etc) and assembled by me, my wife Christine handles all the product packaging. My woodworkers chisel and plane iron honing guides are highly regarded in the UK and North America, my no.1 woodworkers honing/sharpening guide copes perfectly with short bade and narrow chisels, ideal for Japanese chisels, there is nothing else so fast and accurate, unsolicited testimonials tell me so. Because my honing guides are so repeatable you take so little off your chisel each time to resharpen. The Richard Kell no. 2 honing guide (developed upon the advice of my friend Dieter Schmid) is an expanded width version of my first honing guide, the only honing guide that can handle modern spokeshave blades. My no.3 honing guide has two versions, the original 'conventional and skew' being designed to accurately align the Lie Nielsen skew blade as well as the larger chisel and any sharpening of plane irons. The later mark two simplified version does either task yet costs less. Woodworking magazines praise it highly. As with all my products, garden sundials or woodworkers marking and measuring hand tools (bevel gauge, drill and dowel gauge, trysquare, dovetail markers, centre finder, Angle Master, double ended caliper, simple and compound adjustable bevel) or my honing guides for sharpening, you will see that the originality of my design is fine honed over a long period before I make any tooling, and the workmanship cannot be bettered. As I am toolmaker and development engineer trained at Hardy Bros, Alnwick, Northumberland, nothing is sourced outside, I even make my own tooling for vacuum formed display packaging, Leven Plastics doing a good job. For thirteen years and a thousand invoices I designed and produced tooling for North East England electronic manufacturing companies, circuit board assembly, back plane assembly, r.f. front end module (being a self taught short wave radio amateur of thirty years ago probably helped in all this circuit assembly tooling). Jig and tool work included tooling for component pre-form, pitching jigs, flow solder carriers and modifications, inspection overlays ( for smt and pin hole technology, sometimes eight hundred apertures, before vision systems took over), bench top assembly tooling/jigs of many sorts, oddform insertion tooling (connectors, switches, transformers), machine modifications, accurate turned and machined parts in stanyl, peek products, FR4, various tufnols, brass, stainless, etc. Its difficult to fit it all in, please remember that www.richardkell.co.uk is primarily a selling website, though it is utmost in my mind that I hope a broad spectrum of visitors will enjoy the visit.